Done vs. Finished. Just what the heck does that mean? One of the things I had trouble with as a new quilter was the subject of Done vs. Finished. I’d see the terms finished or unfinished in a magazine or pattern and for the life of me, I didn’t know what all the hubbub was about. I made many blocks that didn’t end up the correct size once I had sewn everything together. For that block, I was “done” making it but the block wasn’t “finished.” Dangit! I wanted it to be finished! what I didn’t realize was the rule of seam allowances. Yep, there’s a rule. The rule is that in order for your blocks to correctly fit together, there must be a seam allowance. Seams in quilting are generally sewn at 1/4 inch. That measurement has been accepted as universal in the world of quilting. Say that you want to make a set of blocks and you’ve decided that those blocks need to measure 6 inches square when all is said and done and you’ve got that quilt top ready to quilt. In order for your blocks and any sashing or other pieces to fit together, there needs to be a seam allowance added to each piece. When you sew the blocks together, you take up 1/4 inch of the block on each side. To obtain a perfect 6 inch block, it needs to measure 6.5 inches once you have the block sewn together and it’s sitting there next to your sewing machine waiting to be sewn to the other blocks. A completed block is “done” at that point but it is not “finished” and that’s where the confusion starts. “Finished” means after the block has been sewn on all sides to the other blocks, you can take your ruler and measure to make sure each side of the block measures 6 inches. The overlooked seam allowance is that 1/4 inch allowance that runs along the outer edge of the block. Each side of the block has a seam allowance that’s not taken up yet because it hasn’t been sewn to another block. 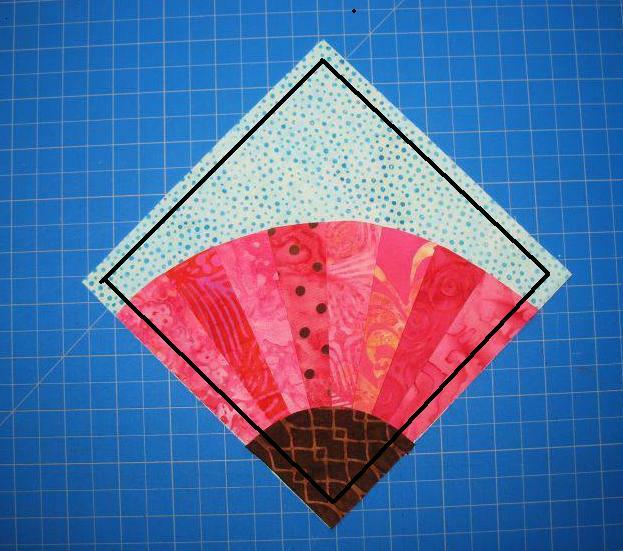 The picture below shows the Old Fashioned Fan Block that I made for the Old Fashioned Fan Quilt tutorial. This block is “done”, meaning I’m done with sewing it together, but it’s not yet “finished”, meaning it has not been sewn to anything else yet and that perimeter seam allowance on each side of it has not been used yet so when I measure it, it should measure 6.5 inches. A block at this stage is considered “UNFINISHED” and that’s what is meant when you see a pattern that states “unfinished block size is 6.5 inches and finished block size is 6 inches.” See on the picture below that black line I put in there? that’s the as yet unused seam allowance that will get taken up when I sew the block to other blocks on all sides. If you measure the edges of that block, you’ll see that they measure 6.5 inches. If you measure the sides within the black seam allowance line, you’ll see that they measure 6 inches, which is what you ultimately want your block to be. Don’t forget about that unused seam allowance when measuring your block for accuracy or to square it up. If your block measures 6 and 1/4 inches, be sure to check your seam allowances that you’ve sewn the block together with. You may need to check to make sure your sewing machine is sewing an accurate 1/4 inch seam allowance. As you progress in building your skills as a quilter, you’ll come to understand the value of an accurate seam allowance. Even a variation of 1/16th of an inch can add up to your measurements being off to the tune of a couple inches overall in your quilt measurements. Happy Quilting! You forgot my favorite one – “Close Enough”. When I am learning a new technique (or making one up myself) Close Enough means that I know what I did wrong, and I can (probably) do it right next time, but I’m not ripping it out and starting over. I’ll either make this into a doll blanket, or re-work my design to look like it’s supposed to be wonky. Oh – I do lots of that. Another factor on getting a 1/4 seam is what thread you use. If you use a heavier thread the diameter of the tread will affect your seam allowance and how thick your seam will be. Use a higher thread number and your seam will sit flatter and your seam allowance will be closure to the 1/4. If you mix thread weights this will affect your seam allowance threw out your project. I know I did it once, what a nightmare. For me it was the confusion of the way we use the word “done” in our everyday English language to mean that something is finished.